In addition to Fabre and Rurale, contributors to The Acquaviva Project include: Patrick Goujon; Guido Mongini; Silvia Mostaccio; Guillermo Wilde; Margherita Trento; Michela Catto; Thomas McCoog, SJ; Claudio Ferlan; Ariane Boltanksi; Aliocha Maldavsky; José Martínez Millán; Esther Jiménez Pablo; Cristiano Casalini; Francesco Mattei; Federica Favino; Giovanna Zanlonghi; Ralph Dekoninck; Franco Motta; and Santo Burgio. 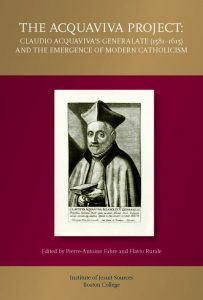 The essays by the scholars fall into five broad categories: shaping Jesuit identity; promotion of foreign missions; economy and politics; education, science, and arts; and distinctive approaches to theology. The publication is a collaborative effort between Jesuit Sources and the Archivum Romanum Societatis Iesu.